This usually happens when you transfer a MetaTexis document to another computer, and another person works on the document. A new translator with a new ID will be added automatically. The user name and user address of the current Microsoft Word user (menu command: Tools | Options, tab User information) are inserted in the Name and Address fields. Edit the fields (if necessary) and click the OK button to save the information and close the dialog box. This usually happens when you transfer a MetaTexis document to another computer on which you are logged in. 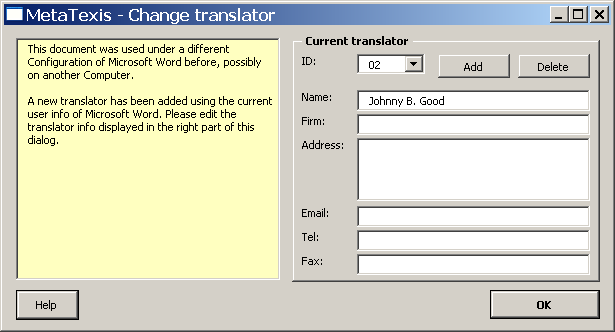 You will be asked to confirm whether the translator shown is still the same. If this is the case, confirm by clicking on the OK button. If this is not the case, you can add a new translator by clicking on the Add button. This can happen when you have changed the user name in Microsoft Word (menu command: Tools | Options, User information tab).